I’ve been teaching for 3 years, I’ve learnt a lot, but also appreciated that the learning never stops. CPD doesn’t mean going on courses, it means spending a reasonable portion of your time looking at new ways of doing things, never just accepting that you are going to teach things the same this year as you did last year. This wonderful tome written by a group of fabulous Amercian teachers is something that I think might become one of those sources I go back to again and again. The basic idea is to replace “Tricks” with a proper teaching of deep understanding. There is a wonderful array of unhelpful mnemonics, cute stories and memorised procedures in here including such gems as “Ball to the Wall” and “Make Mixed Numbers MAD”. For each one, the authors suggest a better approach to instil deep thinking. 2.8 BIDMAS (usually PEDMAS in US schools). The first problem is that Divide doesn’t necessarily come before Multiply. The authors suggest an alternative, GEMA, but I’m not sure that this is all that helpful either. I’ve tended to teach this early, in Year 7 and 8, but the problem is that the second item you come in the list, call it Indices, Powers or Exponents, is not something known at this stage. So I just say, ditch the acronym until much later. Just start with saying multiply/divide happens before add/subtract unless we use brackets to indicate otherwise. 3.5 Dividing fractions. Whilst I have never said “Ours is not to reason why; just invert and multiply” I must confess that I do use Keep Flip Change (KFC) a lot! So I like the idea of getting common denominators first and then dividing the numerators. The idea being that once students practice a few they will discover the short cut. This takes a confident teacher, though. I can think of some students who would just feel that I have wasted their time showing them a long method and might even think I didn’t know the short-cut! Anyway, that really is just scratching the surface of this wonderful resource. It should just make you stop and think about the fundamental way you explain maths concepts. Because it doesn’t matter how many wonderful resources and activities you plan into your lessons, a significant part of students’ learning will still come from your explanations. You don’t get many grey elephants in Denmark, do you? This is a classic that I’m sure most maths teachers will know. I’m just hoping my Year 9 class won’t have seen it when I try it on them next week as part of a probability lesson. In looking for some images I came across an on-line survey that Transum had done following an enquiry from a TV show. The results were interesting and worthy of a few minutes of discussion in class once the “trick” itself has been revealed. 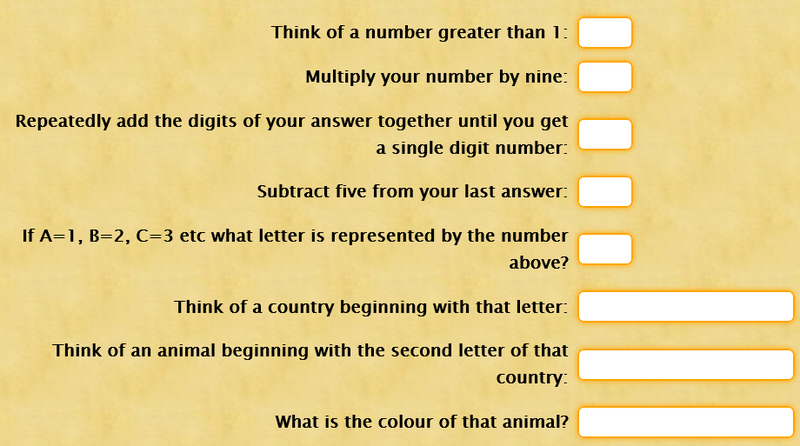 The first part uses the fact that the sum of digits of multiples of nine is always 9, so that you always end up with a 4 which then turns into D. Most people think of Denmark and then Elephant, but not everyone does as demonstrated by the results of Transum’s online survey. This is a nice intro to Tree Diagrams but also gives some scope for discussion of these figures, i.e. What’s the overall % of people that this trick works on? What were the percentages in our class? What percentage of people does it need to work on to have the desired effect in the room?